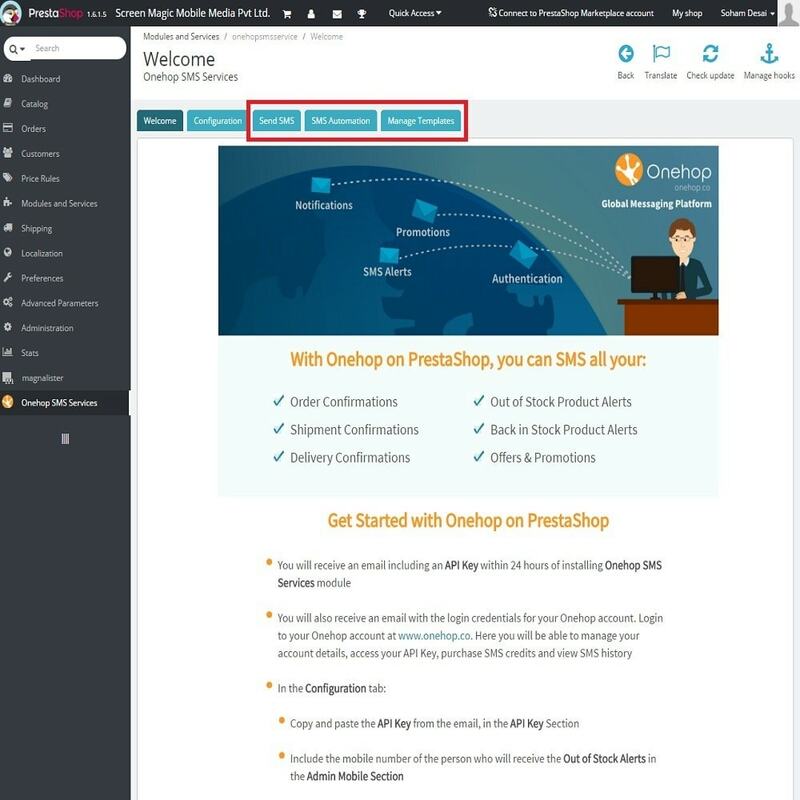 Sending SMS made easy on Prestashop. Whether it's sending auto confirmation messages or keeping your customers posted on the delivery status, SMS Magic can help you improve your Customer Interaction using SMS. Experience the magic of SMS! Merchants can easily interact with their customers via SMS. Order confirmation when an order is placed. Shipment confirmation when a product is shipped. Delivery confirmation when a product is delivered to the customer. Out of stock alerts for merchants to receive an update when a product is out of stock. Back in stock alerts for the customers when merchants update their stocks. Premium and instant support over Email, Call, Live Chat and Facebook. Free, on-call assistance with onboarding. Sending a single SMS is the easiest and the most basic feature of this module. Send SMS instantly from the Prestashop portal. 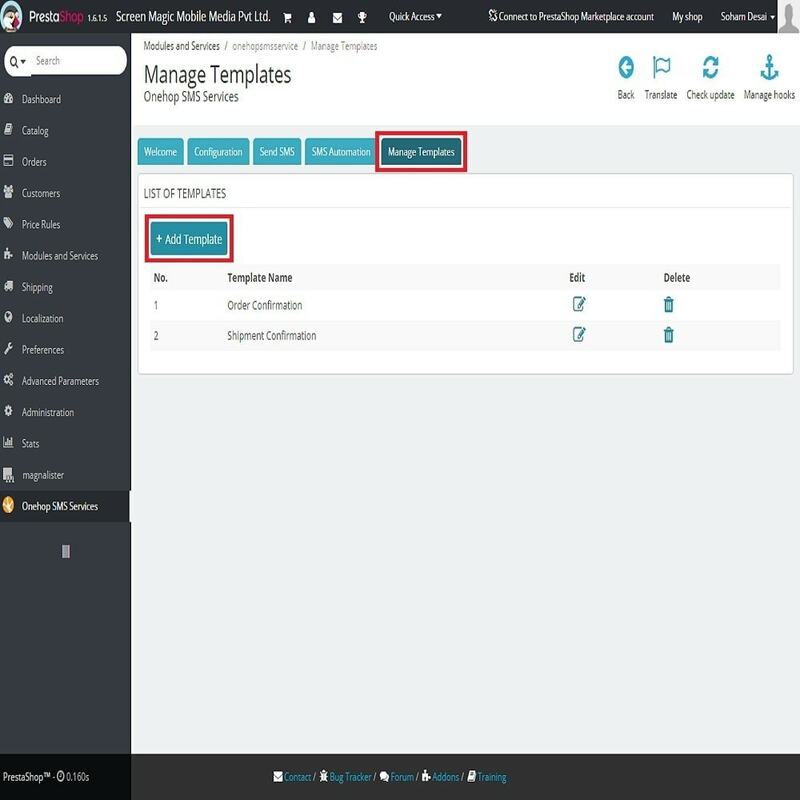 Create and manage custom templates. Reduce the repetitive efforts of composing the same message for different customers. Use dynamic fields to personalize messaging. Gain access to global SMS coverage over 252 countries. Easily add more SMS credits for purchased products. Easy payment checkout process with multiple payment options. View detailed SMS history of sent and received SMS. Prestashop Order Edit module save your time by performing order with more bulk actions. It also allows you to edit & duplicate an existing order. Boost your sales in the Advent season with your daily offers. The nice Xmas Calendar is easy to customize and responsive. Few features of this module work with Mail Alerts Plugin developed by Prestashop. Login to your Prestashop Admin portal. Hover over ‘Modules and Services’ tab and click on ‘Modules and Services’. Go to the search bar and search for ‘SMS’. In the search results, go to ‘SMS-Magic SMS Services’ and click on the ‘Install’ button. 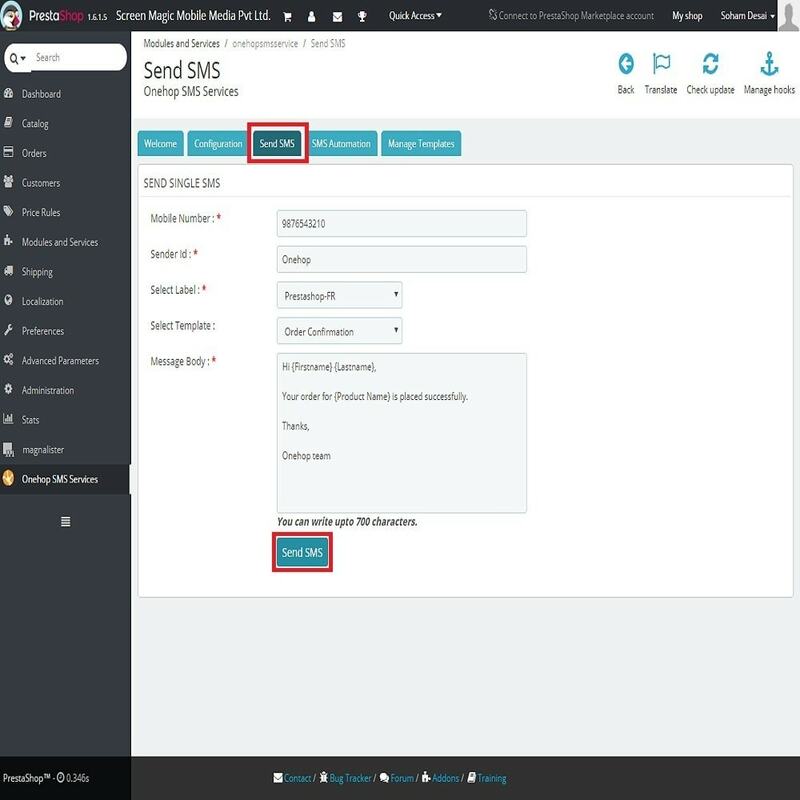 ‘SMS-Magic SMS Services’ module has now been installed and you will see it on the left side of your screen. You will receive an email including ‘API Key’ within 24 hours of installing the module. Once you receive the email with ‘API Key’, copy the ‘API key’ and go to your Prestashop Admin portal. 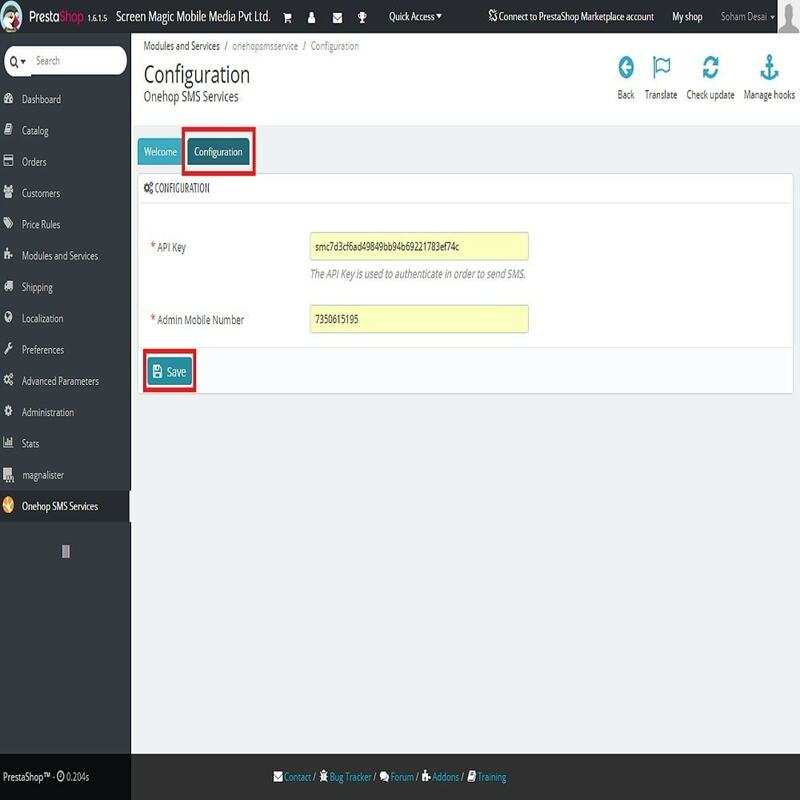 Click on ‘SMS-Magic SMS Services’ and go to ‘Configuration’ tab. Here you shall see the ‘API Key’ section. Paste the copied ‘API Key’ in ‘API Key’ section. Just below the ‘API Key’ section, you will find the ‘Admin Mobile Number’ section. In this section, enter the mobile number of the person who will receive the ‘Out of Stock Alerts’. 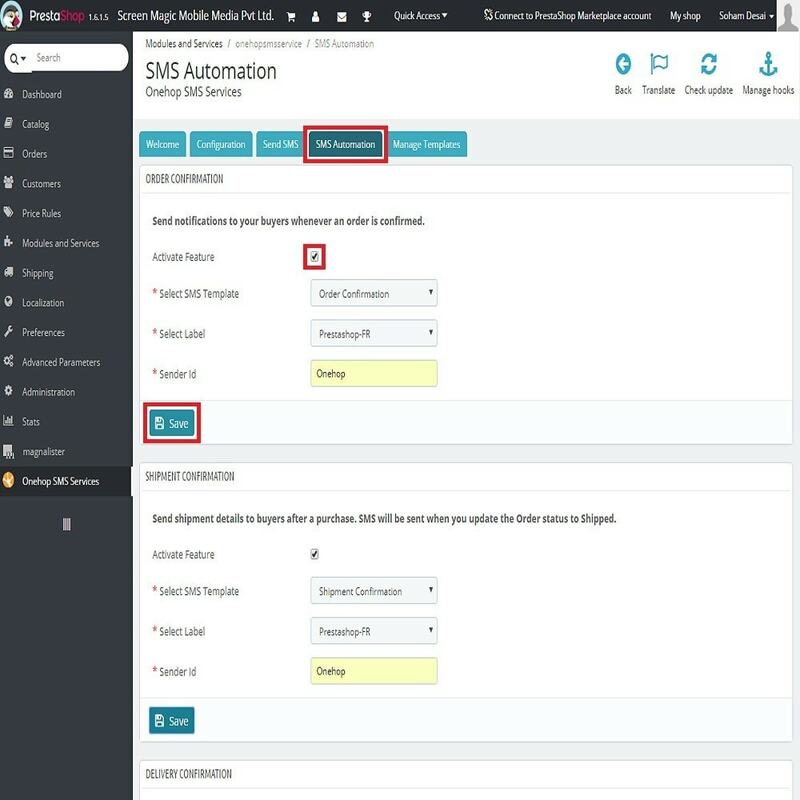 Click on ‘Save’ button to complete the configuration process. Functionality related to 'Label' is no more needed.